^ K. S. BOLSTAD and S. O'SHEA (2004). 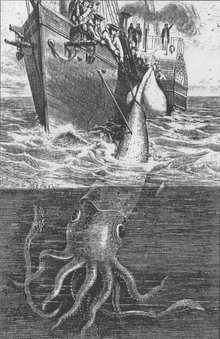 “Gut contents of a giant squid Architeuthis dux (Cephalopoda: Oegopsida) from New Zealand waters”. New Zealand Journal of Zoology 31 (1). doi:10.1080/03014223.2004.9518354.